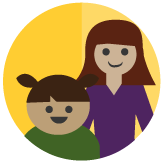 First Teacher/Primer Maestro, was created specifically for Doña Ana Country families who are bi-lingual or monolingual in Spanish. The decided focus of the six-week First Teacher/Primer Maestro program is engaging parents in the education of their children. For parents to succeed in the role as ones who help prepare their children to enter kindergarten –as their children’s teachers — it is important for them to know how children learn and develop, to learn how talking, playing and reading with children develops skills and, finally, to understand the skill requirements for beginning kindergarten. Since it began in 2012, over 1,100 families have earned certificates from the First Teacher/Primer Maestro program. To register for our FREE bilingual classes or for more information please call Maria Zuniga at 575-522-3713. Fridays, February 8th – March 15th from 10:00 a.m. – 11:30 p.m. These classes are still being planned for March 2019. Please call Maria Zuniga 575-522-3713 for more information.